If you love the idea of a Caribbean getaway that doesn't require a passport, there's no better choice for your next vacation than the U.S. Virgin Islands. With their stunning white sand beaches, clear blue water, and laidback atmosphere, these U.S. territories offer tropical relaxation at its finest. 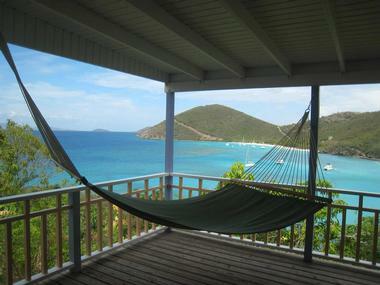 Each of the three islands has a distinctive character, and whether you're interested in diving on St. Croix, hiking through the beautiful parks of St. John, or relaxing in a luxurious resort on St Thomas, you’re sure to find the right place to stay from this list of the best accommodation options in the U.S. Virgin Islands. 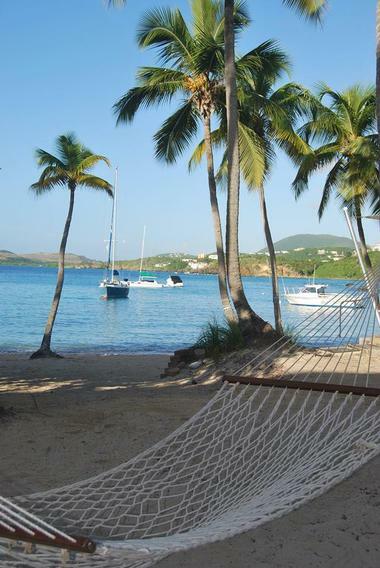 Tucked away on the peaceful eastern end of St. Thomas, Secret Harbour Beach Resort offers comfortable condo-style accommodation with full kitchens, private patios, and separate living areas. A daily housekeeping service is included in the rental rate, and in-room massage services are available by request. The resort also boasts plenty of excellent amenities, including an outdoor freshwater pool, a beach bar, two restaurants, and complimentary beach chairs. The on-site fitness center makes it easy to get some exercise, but guests can also use the resort tennis courts or rent water sports equipment in the lobby. Found on a beautiful 30-acre property right on the beach, the Ritz-Carlton Club, St. Thomas is a luxurious five-star hotel. It shares the property with the Ritz-Carlton, St. Thomas, but Club members enjoy extra perks like a dedicated concierge and access to a private lounge that serves food and beverages all throughout the day. The upscale rooms boast marble surfaces and designer furnishings, and many also offer stunning views of the ocean. You are also welcome to enjoy the resort amenities, which include a beach bar and grill, a fine dining restaurant, a beautiful freeform pool, and a European-style spa. 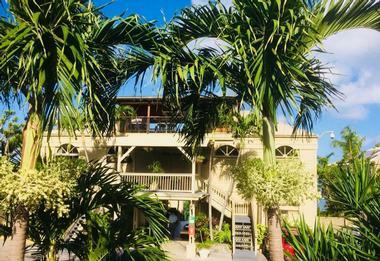 Set on the beach on the western end of St. Croix, the Cottages by the Sea have been family owned and operated since 1949. There are 26 unique cottages spread across the two-acre property. All offer full kitchens, complimentary Wi-Fi, and Caribbean-style decor, and some are located on the beach only steps away from the water. When not in their cottages or on the beach, guests are welcome to relax in the garden gazebo, on one of the four common patios, or in the complimentary beach chairs. Kayaks and bicycles can be borrowed from the front desk free of charge. 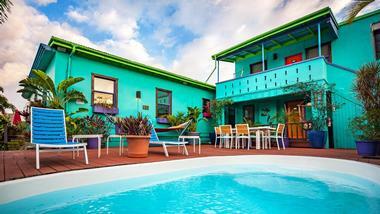 Established in 2010, the Cruz Bay Boutique Hotel is an intimate, boutique-style hotel with only ten rooms and one top-floor suite. All rooms are furnished with pillowtop mattresses, free Wi-Fi, and mini fridges, while the suite offers a full kitchen and soaring twelve-foot ceilings. There are plenty of excellent restaurants within walking distance, and the ground floor of the hotel is home to both an Indian restaurant and an Italian bistro. A complimentary continental breakfast is served every morning on the balcony. Guests are also provided with a daily housekeeping service and given complimentary use of beach towels and lounge chairs. 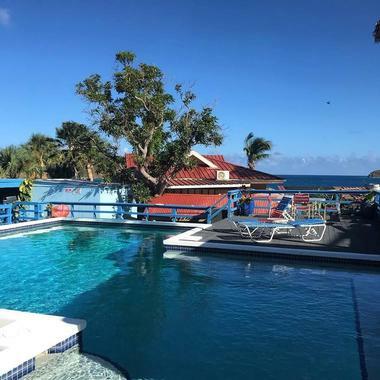 Sitting next to the St. Thomas Yacht Club, Elysian Beach Resort is a peaceful island escape with an excellent selection of studio and one-bedroom suites. All suites are equipped with either full or partial kitchens. 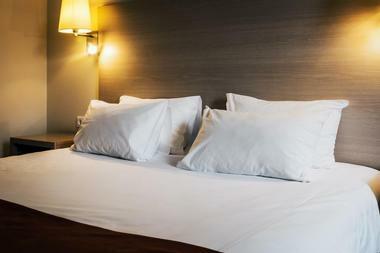 Other in-room amenities include complimentary Wi-Fi, cable TV, and laundry machines. The property also offers a pool and hot tub, a games room, two restaurants, and a tennis court. A shuttle is available during the day to transport guests from the lobby to their rooms, but guests should be aware that the resort's hillside location means that the buildings can only otherwise be accessed by climbing at least 50 stairs. Boasting a wonderful location on a hillside plantation that dates back to the 1720s, Estate Lindholm is an elegant adults-only bed and breakfast. There are seventeen rooms to choose from, all of which have private balconies and kitchenettes with microwaves, mini fridges, and coffee machines. Some rooms also feature special touches like historic stone walls, four-poster beds, or stunning views of the nearby Cruz Bay. A daily continental breakfast is included in the room rate, and you can rent snorkeling equipment from the front desk. Other amenities include a freshwater pool, a garden spa, and a fitness center. 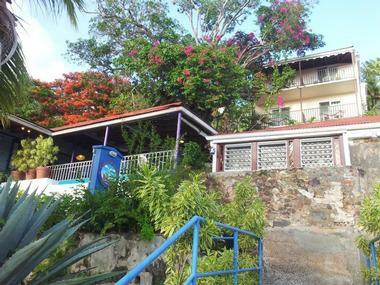 Located on the historic Government Hill in Charlotte Amalie, Galleon House is an affordable bed and breakfast with excellent views. The rooms offer air conditioning, cable TV, and either queen or twin beds. Some also have balconies with views of either the city or the harbor, and in-room Wi-Fi is available for a small fee. A complimentary hot breakfast is served outside on the porch every morning, and alcoholic beverages are available for purchase on-site all day long. Guests are encouraged to relax on the property and enjoy the pool, but there are also plenty of restaurants and shops within a ten-minute walk. Gallows Point Resort is set on a beautifully landscaped five-acre peninsula that juts out into the ocean, and it offers spacious one-bedroom suites with free Wi-Fi and full kitchens. Other in-room highlights include private balconies, flat screen TVs, and separate living areas, but when guests feel inclined to leave the comfort of their rooms, they're welcome to relax in the lounge chairs by the pool or join in on one of the yoga classes held outside on the terrace. There is also an outdoor barbecue area available for guest use, and the on-site restaurant is open for breakfast, lunch, and dinner. 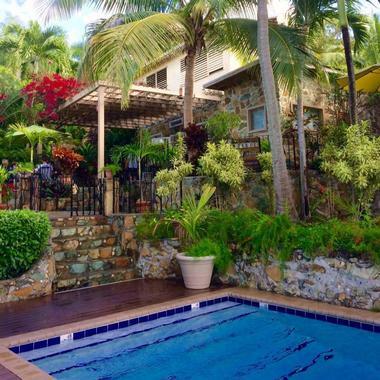 With only three suites, the Garden by the Sea Bed & Breakfast is an exclusive bed and breakfast conveniently located within walking distance of Cruz Bay. The three suites all have different features; one offers a private sitting area, another boasts a private porch with stunning views of Frank Bay, and the third has beautiful mosaic tile floors. All guests have access to a common kitchen with a microwave and a fridge, and a homemade breakfast is served outside on the veranda every morning. 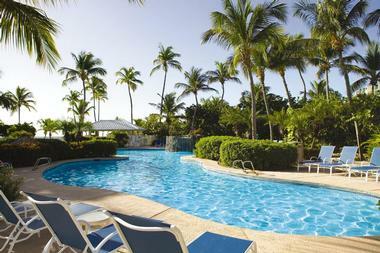 Complimentary beach towels, chairs, blankets, and coolers are included in each suite. Only a few minutes away from the Saint John Ferry terminal, the Grande Bay Resort is an all-suite hotel with beautiful views of the ocean. A wide variety of suites are available, including simple suites, one- to three-bedroom suites perfect for families, and a luxurious penthouse suite with a large private terrace. Free high-speed Wi-Fi is available all throughout the resort, and other in-room amenities include complimentary long-distance phone calls, private balconies, and full kitchens. Complimentary coffee is offered every morning, and guests are more than welcome to make use of the resort's heated outdoor pool. 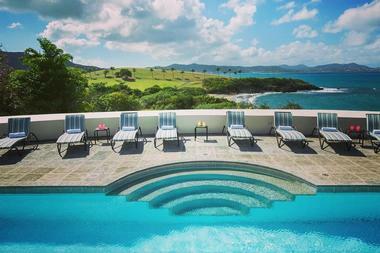 As you might guess from the name, the Hotel On The Cay St. Croix sits on a gorgeous five-acre cay off the coast of St. Croix. Rooms come with kitchenettes, cable TV, and private balconies. Other hotel amenities include free Wi-Fi, an on-site restaurant, and a bar. Guests are welcome to enjoy the hotel's private beach, and the hotel also hosts regular activities, including delicious all-you-can-eat beach barbecues and guided jet ski tours. 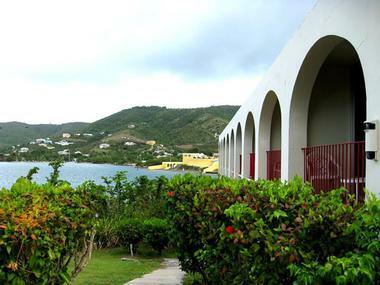 The hotel is only accessibly by boat, but a ferry runs between the cay and the city of Christiansted on the mainland. © Lavender Hill Suites Ltd. 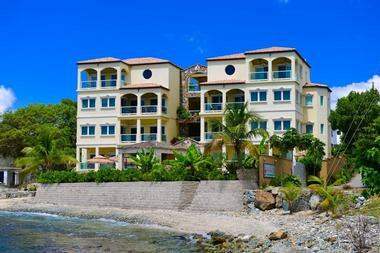 Proudly owner operated, Lavender Hill Suites Ltd. offers condo-style vacation rentals overlooking Cruz Bay. Both one- and two-bedroom units are available, and all feature full kitchens, stunning views of the water, and private patios. Complimentary housekeeping services are offered for stays of seven days or longer, and beach chairs, towels, and coolers are provided in every unit. The beautiful pool is a great place to relax, and although there is no on-site restaurant, plenty of dining options can be found within easy walking distance. On-site amenities include two barbecue grills, free parking, and complimentary laundry facilities. 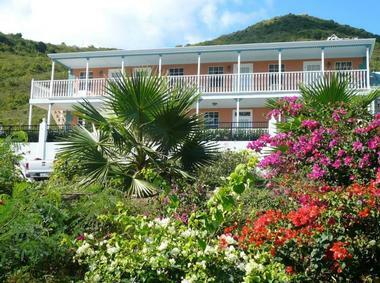 Conveniently located between downtown Charlotte Amalie and the airport, Olga's Fancy Hotel is perched on a beautiful hillside that overlooks the water. 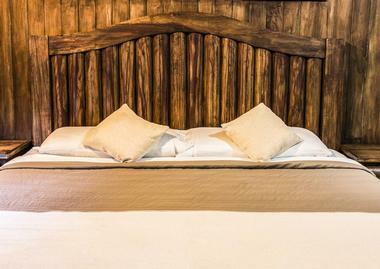 All rooms are equipped with cable TV, complimentary Wi-Fi, and mini fridges. Some offer views of the pool or the harbor, and oceanview rooms feature private balconies perfect for relaxing and enjoying the view. There is also a cottage with a full kitchen, which is ideally suited to families or groups and has a two-night minimum stay requirement. Free on-site parking is provided, and guests are also welcome to enjoy the saltwater pool and covered terrace. 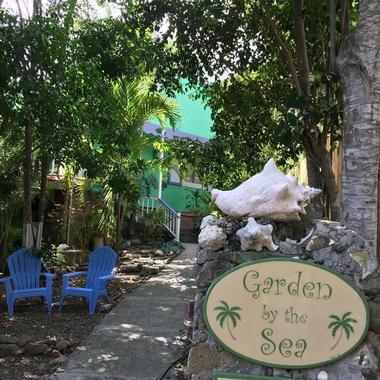 Nestled on Frederiksted Beach, Sand Castle on the Beach offers peaceful Caribbean-themed studios and suites with complimentary Wi-Fi and cable TV. Only guests over the age of sixteen are permitted in the hotel, and live music is played in the on-site bar every Saturday evening. Other on-site amenities include two outdoor swimming pools, a fitness center, and a waterfront restaurant that specializes in seasonal cuisine and artisan cocktails. 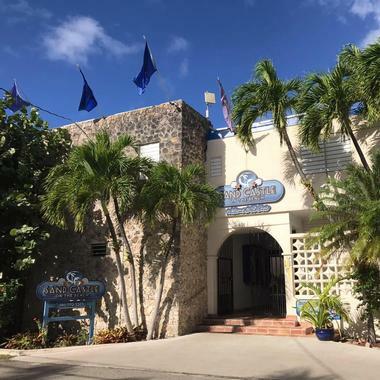 You can rent SCUBA diving and snorkeling equipment from the front desk, and the staff members are more than happy to help you arrange adventures on the land and in the water. Offering beautiful one-, two-, and three-bedroom suites by the water, Sea Shore Allure is a great choice for anyone looking for a luxurious island getaway. All suites have full kitchens and elegant bathrooms with rain showers, and free Wi-Fi is available throughout the entire property. There are plenty of beautiful shared spaces for guests to enjoy, including a rooftop terrace with a hot tub, a private beach with lounge chairs, and a pool area with a bar and flat screen TVs. A private chef service is available upon request, but guests are also welcome to prepare their own food at the gourmet outdoor grill station. Thanks to its central location and its cheerful but unpretentious rooms, the St. John Inn has long been a favorite with budget travelers. 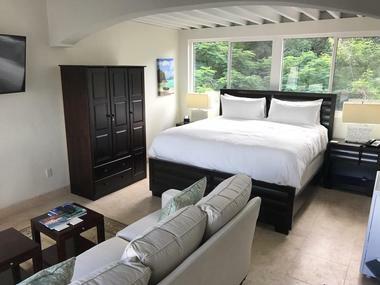 There are several different room types to choose from, including simple rooms with one queen bed, suites with kitchenettes and separate living areas, and two-bedroom suites that can accommodate up to four adults. Beach chairs, towels, and coolers are provided in every room, and other complimentary perks include a daily continental breakfast, a sunset happy hour, and on-site parking. Free Wi-Fi is available throughout the property, and the hotel also offers a pool with a sundeck and an outdoor grill area. Surrounded by a lush tropical garden, the Buccaneer Hotel is an elegant family-owned resort that has been in operation since 1947. The 340-acre property offers plenty of amenities for guests to enjoy, including an 18-hole golf course, a full-service spa, a water sports center, and a shopping center filled with high-end boutiques. Vans are available to transport you around the property as needed, but guests typically also want to spend some time relaxing in their rooms, which boast furnished balconies or patios and satellite TV. Breakfast is included in the room rate, as are introductory SCUBA diving lessons and daily guest activities. 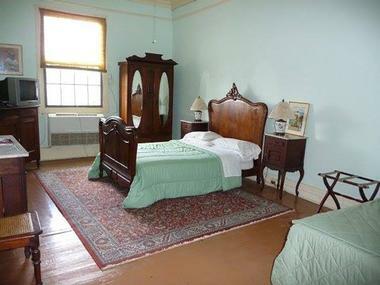 Dating back to the 19th century, the Crystal Palace is a colonial-style bed and breakfast with five rooms. All of the rooms have air conditioning and complimentary Wi-Fi, and two also have private bathrooms and four-poster beds. Guests are also welcome to relax on the patio and enjoy the views of the garden and the harbor. A continental breakfast is served in the dining room every morning, and guests are welcome to prepare their other meals in the shared kitchenette. Free on-site parking is available, and the hotel also offers a complimentary airport pick-up service. 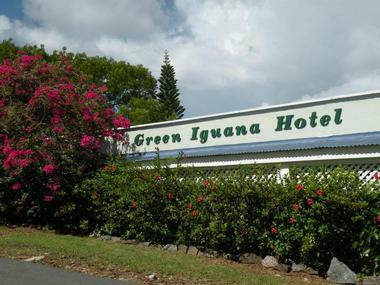 Sitting on a hill overlooking the harbor, the Green Iguana Hotel offers a selection of comfortable rooms with flat screen TVs and harbor views. Some rooms also offer kitchenettes or balconies. There is a picnic area with a barbecue grill, which is perfect for preparing a meal if you don't feel like walking into town. 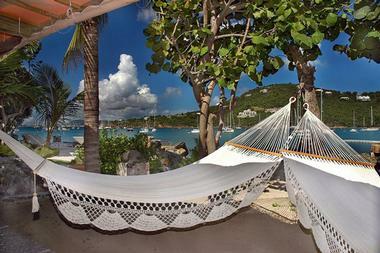 However, many of Charlotte Amalie's best restaurants are only a short stroll away. It also takes less than ten minutes to reach the beach at Magens Bay by taxi, but guests are also welcome to relax on the property and enjoy the beautiful gardens. Perched on top of Bordeaux Mountain, Treetops is an affordable bed and breakfast with three cozy rooms. The rooms are cooled by either air conditioning or ceiling fans, but they vary in size and furnishings. One of the rooms features a kitchenette, while another has a private deck. There is also a shared deck that offers beautiful views of the valley and the surrounding forest. A complimentary breakfast is included in the room rate, and guests are welcome to prepare their other meals outside on the gas barbecue. A minimum stay of two or three nights is required depending on the season. 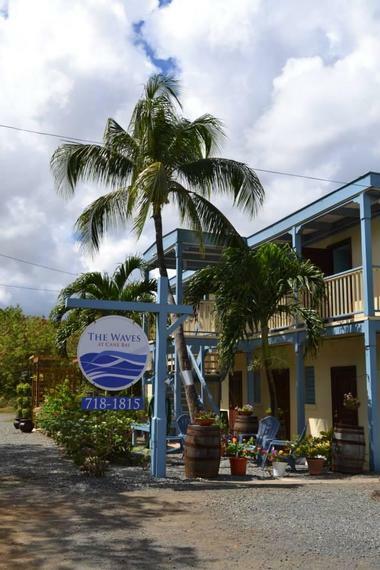 Set amidst the palm trees on Cane Bay Beach, the Waves at Cane Bay is a secluded hotel with only ten rooms. All rooms have satellite TV, free Wi-Fi, and private balconies with views of the ocean; most also offer kitchenettes or full kitchens. The unique on-site lagoon pool is home to a variety of sea life, making it a fun place to snorkel, and the hotel restaurant is one of the best in the area. Yoga classes are held at the hotel twice a week, and you can arrange in-room massage treatments upon request. Complimentary on-site parking is available. 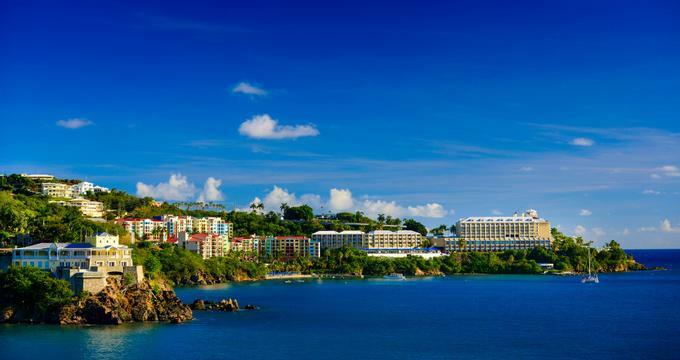 Situated on the hill above the bay that gave it its name, White Bay Villas & Seaside Cottages offers multiple freestanding units with well-equipped full kitchens, cable TV, and backup power. One-, two-, and three-bedroom options are available, and all offer stunning views of the water and the surrounding islands. Complimentary Wi-Fi is available across the entire property, and guests are welcome to make use of the lounge chairs on the beach. Childcare services can be arranged if needed, and the hotel staff is also happy to help guests arrange everything from jeep rentals to fishing tours to dinner reservations. Perched overlooking Columbus Cove, the Arawak Bay The Inn at Salt River is a colonial-style bed and breakfast with a fantastic view. The rooms come with satellite TV, complimentary Wi-Fi, and shared balconies. Telescopes are available for anyone who wants to stargaze or look out at the ships on the water. Guests can visit the dining room every morning to enjoy a complimentary continental breakfast that includes locally-made pastries. You can purchase alcoholic beverages at the on-site honor bar, and other perks of staying here include daily guided walks around the area and an outdoor pool. With its wide selection of vacation rentals in the St. John's area, Artistic Villas has something to offer almost everyone. The rentals range from luxurious beachfront villas with private pools to cozy loft-style studio apartments nestled in the heart of the city, and all come with full kitchens, Wi-Fi, cable TV, and barbecue grills. All rental properties are decorated with beautiful ceramics handmade by the well-known local artist Donald Schnell, who also owns the villas. Private chef and catering services are available, and the company is also happy to help guests arrange taxi services and vehicle rentals. Offering classic bed and breakfast-style accommodation, Bellavista Bed & Breakfast is a beautiful home set in a lush tropical garden. The rooms are equipped with flat screen TVs, private bathrooms, and air conditioning, and they also boast special touches like fresh flowers, comfortable spa robes, and locally-made bath products. Additionally, there are plenty of shared spaces for guests to enjoy, including a peaceful garden, a living room with comfortable furniture, and a swimming pool with a deck. A two-course tropical-style breakfast is included in the room rate, and the hotel provides complimentary bottled water, fruit, and other snacks. 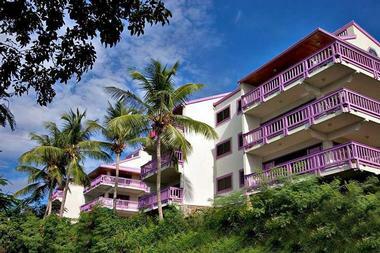 Lavender Hill Suites Ltd., Photo: Lavender Hill Suites Ltd.